Nature has always been an inspiration for inventors. While aircrafts have always borne a resemblance to their feathered counterparts in the sky, new research is bringing the two even closer together. We as humans were always curious to know how the birds could fly, wondering if we too could fly. We could build machines that can fly through the air after carefully studying birds. At any given moment, roughly 5,000 planes are in the skies above the United States and in one year controllers handle an average of 64 million takeoffs and landings! An aircraft landing or take off happens every 45 seconds in Heathrow Airport alone and there could be around 50,000 flights daily carrying nearly a million passengers every day. How do these Aircrafts fly with highest level of safety? PS: If you fly every day for nearly 200 years there is a chance that you would experience an accident. Thrust and Drag Thrust is a force that moves an aircraft in the direction of the motion. Drag is the force that acts opposite to the direction of motion. It tends to slow an object. Drag is caused by friction and differences in air pressure. So it is interesting to know the scientific principles behind this great invention. The Newton's laws of Motion and Bernoulli's principle explain the mechanism of flight and the four basic aerodynamic forces: lift, weight, thrust and drag which together make the flight possible. Thrust is the aerodynamic force that pushes or pulls the airplane forward through space, and the opposing aerodynamic force is drag. Drag is the friction that resists the motion of an object moving through a fluid. Thrust shall be equal to or greater than the drag for the plane to keep flying. The plane will speed up if the thrust is greater than the drag and slow down if drag is greater than thrust. 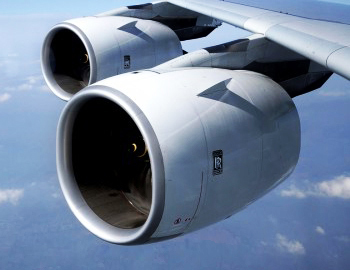 Thrust generated by the engine is the aerodynamic force that pushes or pulls the airplane forward through space. Lift and Weight of an Aircraft Lift is the force that holds an airplane in the air. The wings create most of the lift used by airplanes. Weight is the force caused by gravity. weight is a product of gravity and mass, and lift is the opposing force which holds an airplane in the air. A Boeing 747 passenger airline weighs approximately 440 metric tons, the force with which the plane is drawn toward the Earth. 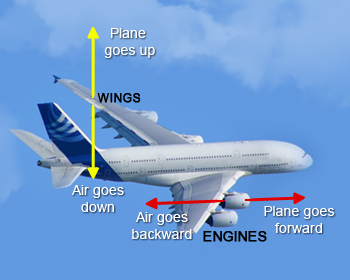 Lift is generated through difference in pressure of air flowing over top and bottom side of the wings. The wing splits the airflow over the wing and down along the underside of the wing which is referred to as an airfoil. The position of the airfoil in flight is usually set at an angle so that air first hits the wing's front edge and bottom, which causes the air stream to split. The air above the wing travels faster over a curved surface than the air below the wing resulting in pressure difference that generates lift. Bernoulli&apos;s principle applied to Aircraft Objects that fly using wings get their lift by taking advantage of Bernoulli's principle. Bernoulli's principle says that as a fluid's velocity increases its pressure decreases. Daniel Bernoulli, an eighteenth–century Swiss scientist, studied fluid flow in pipes. His discovery, now called Bernoulli's principle (which was published in his book Hydrodynamica in 1738), can be stated as follows: When the speed of a fluid increases, internal pressure in the fluid decreases. Consider a continuous flow of liquid or gas through a pipe. 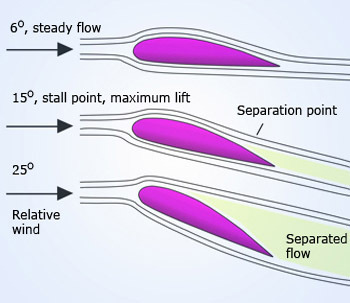 The volume flowing past any cross section of the pipe in a given time is the same as that flowing past any other section of the pipe – even if the pipe widens or narrows. For continuous flow, a fluid speeds up when it goes from a wide to a narrow part of the pipe. This is evident for a broad, slow moving river that flows more swiftly as it enters a narrow gorge. The shape of a wing is called an airfoil, which is shaped and tilted so that the air moving over it travels faster than the air moving underneath (kinetic theory of gases). As air speeds up, its pressure drops and the faster&dash;moving air moving over the wing exerts less pressure on it than the slower air moving underneath the wing. The result is an upward push of lift which picks the bird up. Similarly, when an airplane moves through the air, the air passes over the surface of its wings. These wings are shaped with a curved top surface and a flatter lower surface, which means that air passing over the top of the wing has to travel a little faster than that below the wing. This causes the pressure to lower above the wing, while the air pressure below pushes up. The end result is the lift that keeps the airplane in the air. Inverted flight couldn't be explained by Bernoulli&apos;s principle Physical description of lift which is based primarily on Newton's laws is useful for intuitive understanding of flight phenomena such as the power curve, ground effect, and high–speed stalls. Students of physics and aerodynamics are taught that airplanes fly as a result of Bernoulli's principle, which says that if air speeds up the pressure is lowered. 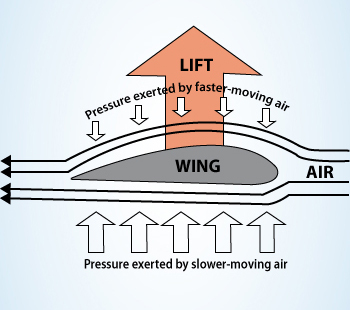 Thus a wing generates lift because the air goes faster over the top creating a region of low pressure, and thus lift. It is however assumed that that when the air separates at the leading edge, the air that goes over the top must converge at the trailing edge with the air that goes under the bottom which is called "principle of equal transit times". 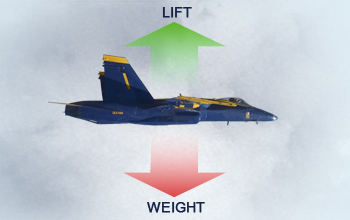 Further the lift generated due to pressure difference is not enough to create the necessary lift for the Aircraft to fly. The major limitation with explanation based on Bernoulli's principle is the "principle of equal transit times". This description focuses on the shape of the wing and prevents one from understanding such important phenomena as inverted flight, power, ground effect, and the dependence of lift on the angle of attack of the wing. 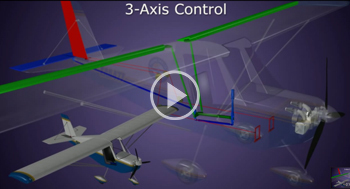 The popular explanation does not address acrobatic airplanes, with symmetric wings or how a wing adjusts for the great changes in load such as when pulling out of a dive or in a steep turn and inverted flights. However physical description of lift which is based primarily on Newton's laws is useful for intuitive understanding of flight phenomena such as the power curve, ground effect, and high–speed stalls. Newton's Third law to explain flight From the conservation of momentum viewpoint, the air is given a downward component of momentum behind the airfoil, and to conserve momentum, something must be given an equal upward momentum. Newton's laws of motion are helpful in explaining this. Newton's first law states that a body at rest will remain at rest, or a body in motion will continue in straight–line motion unless subjected to an external applied force. Newton's third law states that for every action there is an equal and opposite reaction. So to achieve the lift we need force and an action that results in lift as a reaction. When the air is bent around the top of the wing, it lowers the pressure above the wing, causing lift. When a moving fluid, such as air comes into contact with a curved surface, it will try to follow that surface due to viscosity at the boundary layer and the air is diverted downwards. The change in momentum (mv) of the air that is diverted downwards is proportional to the amount of air diverted down per second times the downward velocity of that air. The force which is equal to the rate of change of momentum causes lift and the wing can either divert more air (mass) or increase its downward velocity to generate more lift. The increase in the speed and the increase of the angle of attack causes increase in the downward velocity leading to increase in lift. The power required to create the force is supplied by the airplane's engine. Power needed for the lift is provided by the engine. The power needed to lift the airplane is proportional to the load times the vertical velocity of the air. The power needed for lift is proportional to the amount of air diverted down times the velocity squared of that diverted air. Thus, the power needed to lift the airplane is proportional to the load times the vertical velocity of the air. If the speed of the plane is doubled the amount of air diverted down doubles and the power required for lift becomes less as the airplane's speed increases. We need more power to increase the speed than the power required for lift. The power associated with lift, described above, is often called the "induced" power. We also need power to overcome the drag associated with moving the wheels, struts, antenna and other parts on the surface of the airframe through the air. The amount of air diverted by the wing is proportional to the speed of the wing and the air density. The vertical velocity of the diverted air is proportional to the speed of the wing and the angle of attack. The lift is proportional to the amount of air diverted times the vertical velocity of the air. The power needed for lift is proportional to the lift times the vertical velocity of the air. So Bernoulli's principle alone can not explain different flight conditions including inverted flight scenario as well as change in power requirement with changes in load and speed of the plane. Aerial Navigation Successful air navigation involves piloting an aircraft from place to place without getting lost, breaking the laws applying to aircraft, or endangering the safety of those on board or on the ground. 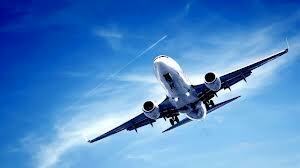 How does an airplane take off, rise to a higher altitude, turn in the air or land on the ground? Drag, Lift and Speed of the aircraft depend on the Angle of attack to a certain extent. Angle of attack is the angle at which relative wind meets an airfoil. It changes with the direction of the aircraft. The increase in angle of attack increases lift up to a point, beyond which it results in a loss of lift and can cause an aircraft to stall and this angle is known as stall angle. The airspeed at which the aircraft stalls varies with the weight of the aircraft. The wings on most planes are designed to provide an appropriate amount of lift along with minimal drag when the plane is operating in its cruising mode as wings need to present a negative angle of attack in order to achieve zero lift, while cruising without change in altitude. During takeoff and landing, the flaps on the back of the wing extend downward from the trailing edge of the wings to alter the shape of the wing, allowing it to divert more air, and thus create more lift. The alteration also increases drag, which helps airplane to slow down during landing. Slats perform the same function as flaps but they're attached to the front of the wing instead of the rear. 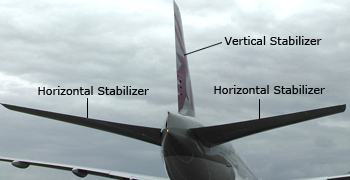 Airfoils and their flaps are helpful in navigating the aircraft. The lift coefficient of airfoil depends on air speed, air density, wing area and angle of attack. Aircraft stabilizer An aircraft stabilizer is an aerodynamic surface, typically including one or more movable control surfaces, that provides longitudinal, directional stability and control. The tail of the airplane has two types of small wings, called the horizontal and vertical stabilizers which alter the air flow using flaps. A pilot uses these flaps on the stabilizers to control the direction of the plane. The flaps on the horizontal tail wing, are called elevators as they enable the plane to go up and down through the air. These flaps change the horizontal stabilizer's angle of attack, and the resulting lift either raises the rear of the aircraft (pointing the nose down) or lowers it (pointing the nose skyward). The vertical tail wing features a flap known as Rudder which enables the plane to turn left or right. The Ailerons which are horizontal flaps located near the end of an airplane's wings allow one wing to generate more lift than the other by deflecting upward or downward in opposite directions, resulting in a rolling motion that allows the plane to bank left or right. The pilot tilts the angle of the airfoil by operating ailerons to turn the aircraft over the roll axis and manipulates the aircraft's rudder to maintain course . Pilot may change the elevator position to tilt the tail down, raise the nose and the put the plane in ascending path and vice versa. An aircraft's flight is a careful balance of thrust, drag, weight and lift. Sudden changes in lift, drag and angle of attack balance is lost and a stall occurs, which can be corrected by lowering the angle of attack. If it is not corrected properly stall can result in a secondary stall, or degrade into a spin. The spin could be intentional as displayed in air shows or accidental. Spin could be dangerous if it is not quickly corrected. Four–stroke engine of an Airplane Four stroke engines are more fuel efficient, quieter, sound cooler, and turn bigger props at a little slower rpm, which makes for better propeller efficiency. To move an aircraft through the air, we have to use some kind of propulsion system to generate thrust. Aircraft powered by piston engines get virtually all of their thrust from the propeller driven by the engine. This type of engine mixes fuel with air and burns the fuel to release the energy. The resulting heated gas moves a piston, which is attached to a crankshaft. This spins a propeller, or prop, which is essentially an array of spinning wings. Each blade is an airfoil with an angle of attack. The angle is greater toward the center because the speed of the propeller through the air is slower close to the hub. Many larger prop–driven aircraft boast propellers with adjustable pitch mechanisms. These mechanisms let the pilot adjust the propeller's angle of attack depending on air speed and altitude. Rocket engine uses the surrounding air as the working fluid of its propulsion and all that a rocket needs is the thrust of its own combustion exhaust gas which is why a rocket can provide thrust in space while a propeller cannot. A rocket engine combines fuel and an internal source of oxygen called an oxidizer. 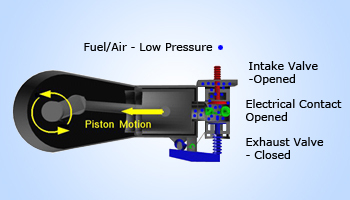 The oxygen and fuel ignite in a combustion chamber, and the hot exhaust gases pass through a nozzle to produce thrust. Gas turbine engine, also known as a jet engine, works a lot like a rocket engine. 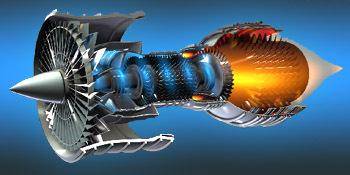 Gas turbine engines collect the necessary air through fan-like rotary compressors. 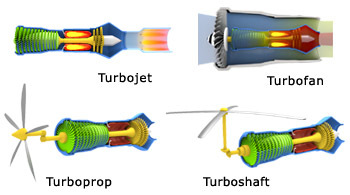 Turbojet engines produce thrust by accelerating air through the core of the engine. Turbofan engines produce thrust primarily by driving a large fan in front of the engine. Turboprop engines produce thrust by driving a propeller. Turboshaft engines produce power by driving a shaft. The most widely used form of propulsion system for modern aircraft is the gas turbine engine. Gas turbines such as turbojet, turbofan, turboprop and turboshaft are particularly suited for aircraft propulsion because they are light and compact and have a high power to weight ratio. Aircraft gas turbines operate on an open system called Jet Propulsion Cycle which involve thermodynamic laws. The first and second law of thermodynamics are generally illustrated for closed systems such as Carnot, Rankine, Ottto, Diesel and Brayton cycle. Their ideal performance are calculated based on the assumption of reversible transformations. Most of the machines that transfer thermal energy contain fluids that exchange energy with their surroundings. 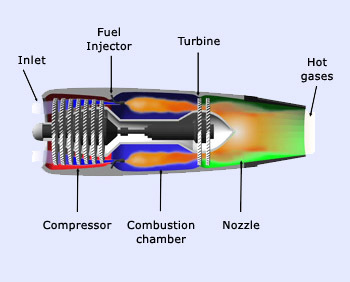 Turbojet engines which can be viewed as an assemblage of several of these devices, provide an important and interesting application of thermodynamic laws to open systems. Let us analyze the generic jet engines of aircraft to show the simplicity, power and the beauty of the laws of thermodynamics. We will introduce the basic concepts of thrust and the overall propulsive efficiency, which will help us to measure the performance of jet engines of aircraft. In jet-propulsion cycle, the gases are expanded to a pressure such that the power produced is only enough to drive the compressor and the auxiliary equipment. Therefore, the net work output of a jet-propulsion cycle is zero. The high pressure gases exit from the turbine are sent to a nozzle. They are accelerated in the nozzle to provide the thrust to propel the aircraft. 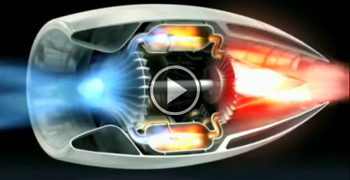 How does a Turbojet Engine work? Jet engines move the aircraft forward with a great force that is produced by a tremendous thrust and causes the plane to fly very fast. Aircrafts are propelled by accelerating a fluid in the opposite direction to motion. Generally a propeller-driven engine accomplishes this by slightly accelerating a large mass of fluid, but jet engines accomplishes this by greatly accelerating a small mass of fluid. Large amounts of surrounding air are continuously brought into the engine inlet. At the rear of the inlet, the air enters the compressor through a diffuser. The diffuser placed before the compressor decelerates the incoming air relative to the engine. A slight pressure rise is associated with this deceleration. The compressor raises the pressure of the air. The compressor is made with many blades attached to a shaft. The blades spin at high speed and compress the air resulting in an increase in the air pressure. In the combustor the compressed air is mixed with fuel and an electric spark ignites the mixture. The ignition of air and fuel provides a high temperature, high-energy airflow. The fuel burns with the oxygen in the compressed air, producing hot and high energy gases. The high-energy gases coming out of the combustor goes into the turbine, causing the turbine blades to rotate. The burning gases expand and blast out through the nozzle, at the back of the engine. The nozzle is the exhaust duct of the engine. This is the engine part which actually produces the thrust for the plane. As the jets of gas shoot backward, the engine and the aircraft are thrust forward. (a) adiabatic compression in the inlet and compressor (1-2), (b) constant pressure heat addition in the combustor (2-3), (c) adiabatic expansion in the turbine and exhaust nozzle, and finally (3-4), (d) constant pressure cooling to get the working fluid back to the initial condition (4-1). As discussed, in a turbojet engine, the air enters the engine through a diffuser, which lowers its speed and increases its pressure. The air then goes into the combustion chamber, and each unit mass of air absorbs energy Q, increasing its internal energy. Finally, the gases expand in the nozzle to the ambient pressure and leave the aircrafts at high velocity. ΔH is the difference between the exit and inlet specific enthalpies and ΔE is the difference between the exit and inlet kinetic energies per unit mass. However, the second law of thermodynamics implies that the complete conversion of thermal energy into work (or into kinetic energy of the air) is impossible and that the most favorable situation (maximum production of work) is realized if all the processes are reversible. The processes in the diffuser, the compressor, the turbine and the nozzle are assumed to be reversible and adiabatic. 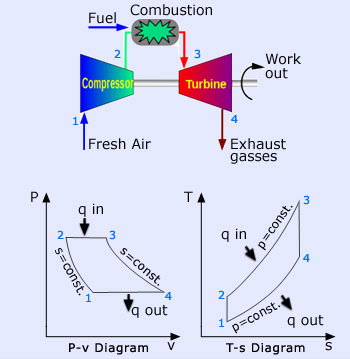 In an ideal jet-propulsion cycle, the power generated in the turbine equals the power consumed in the compressor. (i) propulsive efficiency (ηp): how much of the energy of the jet ends up in the vehicle body rather than being carried away as kinetic energy of the jet. (ii) cycle efficiency (ηc): how efficiently the engine can accelerate the jet. vexit = velocity of gases exhausted from the nozzle, relative to the aircraft. vinlet = inlet air velocity, relative to the aircraft. Usually, in aircraft the mass airflow rate m is associated with the physical size of an engine, including diameter and weight. Thus the reduced thrust is proportional to the thrust-to-weight ratio. The propulsive power 'Wp' of the engine is given by the propulsive force times the distance this force acts on the aircraft per unit time, which is the aircraft's velocity. The overall efficiency 'η' of an aircraft engine is defined as the ratio of the (mechanical) propulsive power to the thermal power obtained when fuel is burned i.e the thermal energy of the fuel released in the combustion process. This efficiency is called the propulsive efficiency. A Doppler radar is a specialized radar that makes use of the Doppler effect to produce velocity data about objects at a distance. It does this by beaming a microwave signal towards a desired target and listening for its reflection, then analyzing how the frequency of the returned signal has been altered by the object's motion. The search for the missing Malaysian Airlines flight 370 in the month of March 2014, has raised many questions about how aircraft are tracked. One of the key means of tracking the position of aircraft is via Radar, a system that operates at radio frequencies (RF) between 300 MHz and 15 GHz. They generate electromagnetic fields that are called RF fields. The aircraft height above ground is determined by radar altimeters that assist in safe and efficient flight. Airborne Doppler navigation radars measure the vector velocity of the aircraft and determines the distance traveled. Weather avoidance radars identify dangerous weather phenomena and assist the pilot to avoid them. 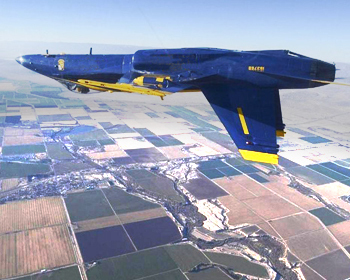 Some military pilots, who train at low altitudes, use terrain-following and terrain-avoidance radars that allow the pilot to closely fly over the ground and fly over or around other obstacles in its path. Air traffic control uses radar to track aircraft both on the ground and in the air, and also to guide aircraft for smooth landings. A typical surveillance radar sends a signal that causes the aircraft's transponder to reply and provide its position. Most Radar antennas revolve at a rate of 5 revolutions per minute, therefore the time taken by the signal to return back is 12 s.
How does an aircraft radar work and what is its importance? Radar (an acronym for RAdio Detection And Ranging) is a device that is used extensively on aircraft. It works on echo principle. Just like other radar systems, aircraft radar also contains high frequency radio waves that are transmitted for a short time phase during which the waves reach the highest altitude. When any kind of solid obstruction comes in the path of the transmitted waves, it strikes the object and gets reflected back to the radar, helping the object's detection along with its exact distance from the radar. The working of radar system on an aircraft begins from the time it's installed onboard The radio waves used by radar are produced by a piece of equipment called a magnetron. These radio waves are composed of wavering patterns of electrical and magnetic energy, traveling at a speed almost equivalent to light waves but with longer wavelengths and higher frequencies. Generated waves are forced into the air by an antenna that works as a transmitter. The transmitter consists of an electronic circuit that osciallates at a specific frequency, usually much higher than those frequencies used for radio or TV broadcasts. These curved radar antennas focus the waves into precise, narrow beams and even rotate to detect movements over an expansive area. The waves travel from the antenna at speed of light continuously till they hit an obstruction, and some of them are bounced back to the antenna. The traveling speed of these waves needs to be high, as signals need to travel faster than the obstruction. As radio waves travel at light speed, they are faster than most of the objects. The antenna is both the transmitter and receiver of the radar. First it transmits the waves and then it waits for the reflected waves, which are then directed to electronic equipment where they are processed and displayed in a consequential manner on a television-like screen overlooked by a human operator. The radar enables the operator to view nearby ships and planes, their location as well as speed and direction. An aircraft radar is an extremely important device during foggy conditions, as bad weather cannot obstruct radio waves and thus is highly beneficial in helping an aircraft easily navigate. ATC is a service provided by ground-based controllers who direct aircraft on the ground and through controlled airspace, and can provide advisory services to aircraft in non-controlled airspace. The primary purpose of ATC worldwide is to prevent collisions, organize and expedite the flow of traffic, and provide information and other support for pilots. How does an Air traffic control work (ATC)? 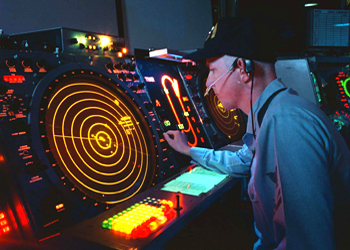 Radar began to be widely adopted by air traffic controllers (ATC) in the 1950s and is still the mainstay of most ATC systems around the world today. The standard international practice is to monitor airspace using two radar systems: primary and secondary. 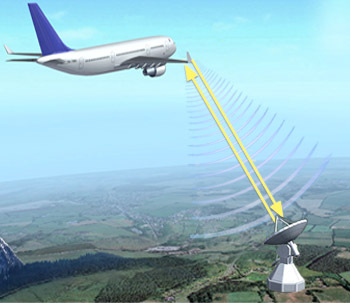 Primary radar sends out electromagnetic waves that are reflected back by the aircraft. It detects and measures the approximate position of aircraft using the reflected radio signals. This radar can see everything no matter if the transponder is on or off, but it can't identify the object. It can just see a point on the screen. Primary radar is generally used more for military air defence. 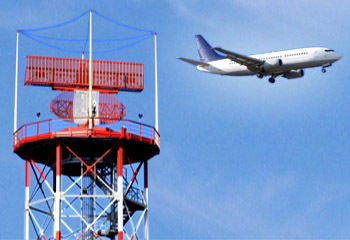 ATC who manage commercial air traffic rely on secondary radar, which also sends out electromagnetic waves, but when the plane picks them up, its transponder (short for transmitter-responder) sends back a signal identifying the plane and giving its altitude, speed and bearing.All commercial aircraft are equipped with transponders which automatically transmit a unique four-digit code when they receive a radio signal sent by radar. The code gives the plane's identity and radar stations go on to establish speed and direction by monitoring successive transmissions. This flight data is then relayed to ATC. However, once an aircraft is more than 240km out to sea, radar coverage fades and air crew keep in touch with ATC and other aircraft using high-frequency radio. Air traffic control system Aircraft control facilitates the safe and orderly movement of aircraft within and between airports by receiving and processing data from radar and devices that monitor local weather conditions and by maintaining radio contact with pilots. Airspeed indicator, differential pressure gauge tells the pilot how fast the aircraft is traveling in relation to the ground. Altimeter measures altitude through measurement of pressure. Attitude indicator provides the aircraft's orientation along all three axis - pitch, yaw and roll and with the use of a gyroscope it can provide spatial clarity even in disorienting flight conditions. Heading indicator gives the direction in which the plane is heading. Turn coordinator indicates the plane's yaw or roll rate and also when the aircraft is skidding or slipping. Vertical speed indicator indicates the rate of climb or descent of a plane. Avionics include communication equipment, navigation systems, collision avoidance and meteorological systems. 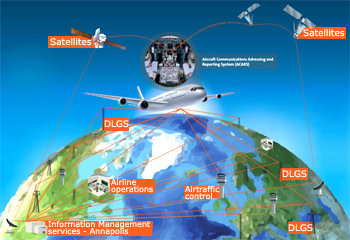 Air traffic control system ensures the safety of commercial and private aircraft as they take off, land and cover long distances with the help of Radars, computerized flight plans and steady communication, air traffic controllers keeping planes at safe distances from each other and redirecting them in bad weather conditions. Traditional aircraft communications are based on analog voice on either a Very High Frequency (VHF) or High Frequency (HF) radio waves. In the mid 1980s the use of data-based communications became a reality. 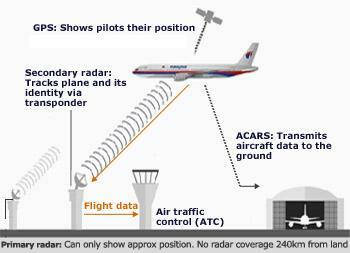 The Aircraft Communications Addressing and Reporting System, known as ACARS, is the air-to-ground digital data linked communication service to communicate with air traffic control, national aviation authorities and their own operations centers. At first ACARS relied exclusively on VHF (Very High Frequency) channels but more recently, data transmission have been added which have greatly enhanced its geographical coverage. Airlines use ACARS VHF and HF ground stations as well as satellite communications to send and receive billions of Air Traffic Control (ATC) and Airline Operational Control (AOC) messages every year. AOC messages include take-off and landing confirmation, weather information, gate information, and engine reports. ATC messages include navigation information, aircraft positional reporting, departure clearances, oceanic clearances, runway conditions, and weather data. Airspace management is transcending into the computer age and as new requirements evolve and the choice of communications technologies expand, regulating the world’s air traffic flow can safely become more automated. 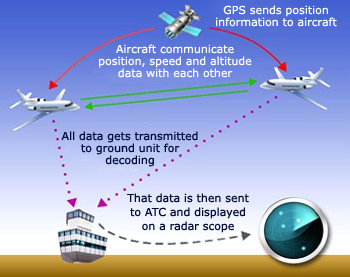 ADS-B is a system in which electronic equipment onboard an aircraft automatically broadcasts the precise location of the aircraft via a digital data link. The data can be used by other aircraft and air traffic control to show the aircraft’s position and altitude on display screens without the need for radar.The system involves an aircraft with ADS-B determining its position using GPS. A suitable transmitter then broadcasts that position at rapid intervals, along with identity, altitude, velocity and other data. Our ancestors had to go to pretty extreme measures to keep from getting lost. They erected monumental landmarks, laboriously drafted detailed maps and learned to read the stars in the night sky. Things are much, much easier today. You can get a pocket-sized gadget that will tell you exactly where you are on Earth at any moment. As long as you have a GPS receiver and a clear view of the sky, you'll never be lost again. The Global Positioning System (GPS) is a satellite-based radio navigation system used in aircraft to increase the safety and efficiency of flight. GPS is a location system based on a constellation of 24 satellites orbiting the earth at altitudes of approximately 20,000 kilometres. Each satellite transmits a regular GPS signal that is carried by radio waves in the microwave part of the electromagnetic spectrum. GPS is a staple of modern life, the world's ATC network is still almost entirely radar-based. Aircraft use GPS to show pilots their position on a map. Some of the most modern aircraft are able to "uplink" GPS data to satellite tracking services, but handling large volumes of flight data is expensive and such systems are usually only used in remote areas with no radar coverage. ADS-B (Automatic Dependent Surveillance Broadcast) has replaced radar as the primary surveillance method for ATC. ADS-B will see aircraft work out their position using GPS and then relay data to the ground and other planes.